Refill pack for NOTE BOX, 7714. 500 blank notes. Stylish note box complete with 500 blank white notes (90mmx90mm). The slightly angled holder and a simple cut-out enable easy removal of single sheets. With pen holder. Stylish paper clip dispenser complete with 100 paper clips. With large magnetised rim for easy removal of clips. Non slip base with rubber feet. 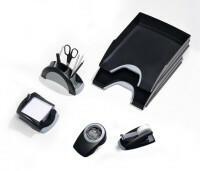 Pen holder with five different size compartments capable of storing pens, scissors, paper clips etc. High quality, weighted tape dispenser with non-slip feet for ease of use. Suitable for use in the home or office. Replacement rolls are easily inserted.